I helped post the following picture and information on the subject thread to make it available to the Aussie owner of a new Miroku 1886 .45-70 . As is normal, he has had some interesting learning experiences with the new rifle. With careful bullet selection, in an 1886 rifle, the 45/70 can equal the 45/90 and, to my mind at least, provide greater flexibility. 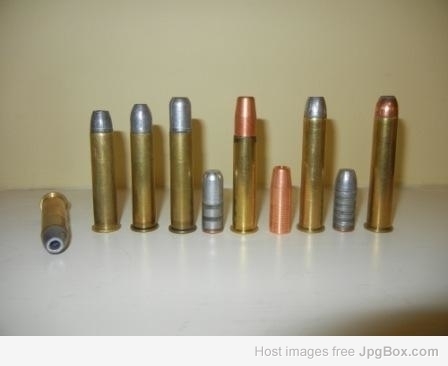 All the bullets in the 45/70 cases above have a diameter of approx. 0.450" ahead of the cannelure. They can be crimped into the cannelure for an OAL of approx. 2.8" or less. They fit a factory, no throat 45/70 chamber and cycle with ease through the 1886 action.